Well Mike and i were over the moon when we heard he had been accepted as a candidate for Gamma Knife Surgery under Professor Lindquist at the Bupa Cromwell Hospital in London. The only downside was we had to wait two weeks for the appointment, where further MRI scans were needed to reassess the disease at that point and were far more detailed. If they were happy that the tumours were still treatable, the surgery would be on Tuesday 5th April (the following day). That two weeks could not have come quick enough. Mike had been in and out of the hospice frequently, but managed to come home in the week preceding treatment. Due to the fits he had been having he was being followed everywhere around the house as he would suddenly go man down and on two occasions had collapsed. Once at the hospice and woke on the floor with all the nurses around him (one way to get all the female attention) and once at home when trying to walk from his man’s room into the kitchen, where i managed to break his fall. He hated being followed everywhere like a child, but we were all so concerned about him banging his head if he was to fall as we had been told this would be bad news. So asides from a couple of occasions he understood our reasons and tolerated us doing this as he was also keen to get safely to London for the Gamma knife. After what felt like an eternal wait the day came that we went off to London. We were warned it would be a very long couple of days, but had managed to source a hotel 400 metres walk from the Cromwell and an Army car and driver would get us there and back. (Thank you Jordan!) We left early in the morning had an appointment and scans in the afternoon and after a tense day of praying they would be able to treat the tumours, finally received the good news that they could treat some, but not all of them. 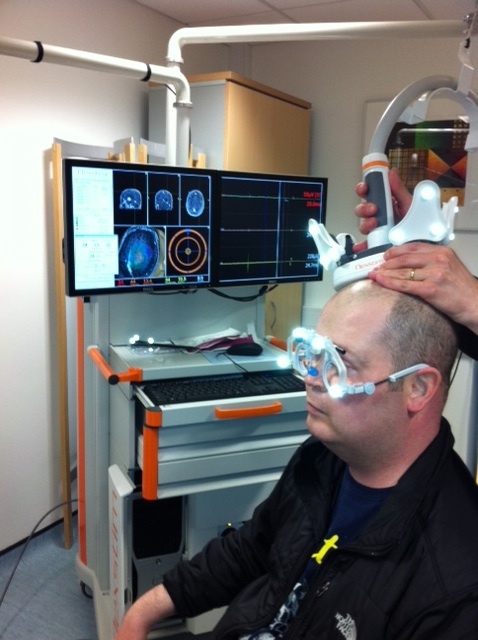 Due to their location Mike then underwent nerve conduction studies to work out how much radiation they could deliver to the tumours without doing more harm than good. Such amazing technology, just a shame about the “should have gone to Specsavers” look! 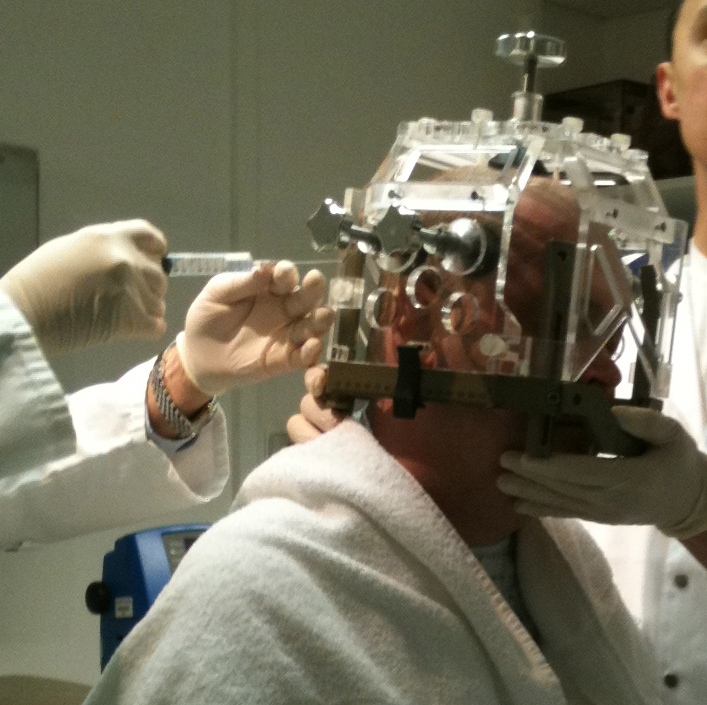 This revealed why Mike had started having the fits as there were two major tumours sitting practically on top of the motor centres in his brain. We finally left the hospital at 19:45 that night. He was so tired and we had to return at 6:30 the following morning to have his head frame fitted at 8:30. 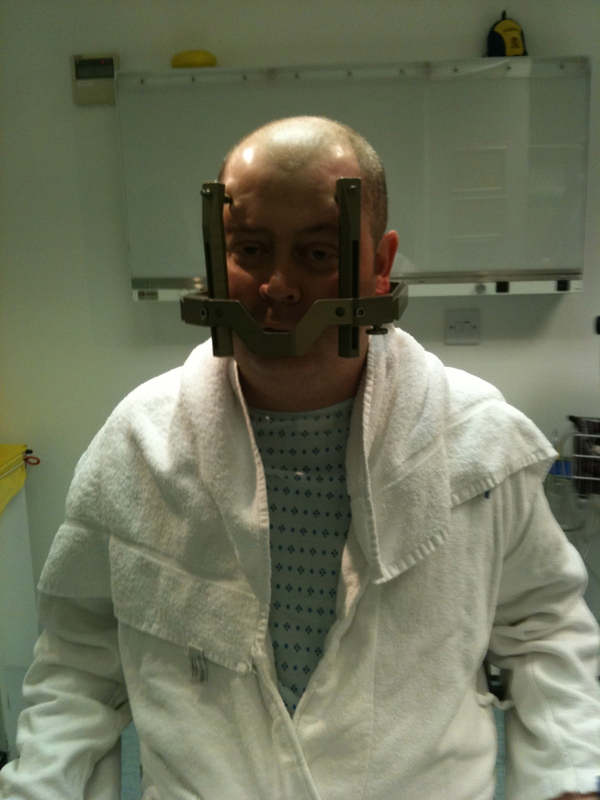 Following the fitting, he then had yet more MRI scans with the frame on to precisely locate tumours and head position for treatment and then a 4 hour wait, with the frame on, whist professionals planned how and which tumours would be treated. Despite the cumbersome frame mike was expected to eat, drink and rest. When we finally got the call for him to begin treatment, hooray, we were both somewhat shocked to hear it was going to take 4 hours! 4 hours locked in one position, with quiet iPod music being played that he could hardly hear and no other sounds or movement. Mike said he was completely unaware that anything at all was happening and once an hour he would ask for a toilet break just so he could move. 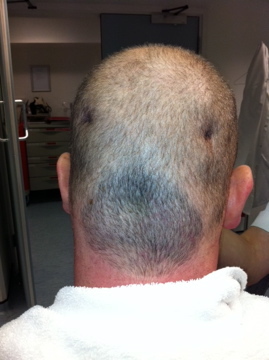 At about 18:30 treatment finally stopped and the frame was removed. Such a relief to get the frame off and be able to go and lie down comfortably, except for the very common, extreme headache that followed. Needless to say Mike was keen to leave as early as humanly possible the next morning, after hearing they managed to successfully treat 9 of the largest tumours! (Please note that this was written by myself, Kady Parke on Mike’s behalf. Unfortunately i do not share his writing finesse, but felt in Mike’s memory his story needs to be finished). I only met mike on a couple off occasions, and i know you wasn’t a great fan of him having tattoos. But i,m so glad i had the chance to meat and talk to such an amazing gentleman. My self and my families thoughts are with you at this difficult time. I know it must have been so hard to write this so soon after the passig of Mike, nut jus let me say you have done Mke’s memory more than justice. A post he ould be proud of.